This map, made in 1900 by a James Mooney and found here at the fantastic Perry-Castañeda map collection at the University of Texas, shows the shrinkage of Cherokee Country in its original location in the southeastern US. 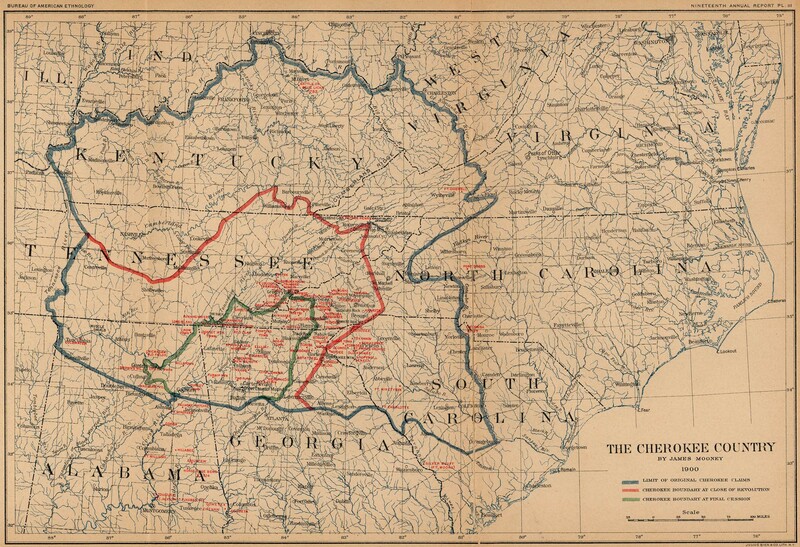 • Original Cherokee lands (blue line): before European colonisation, contains the entire state of Kentucky, save for the so-called Jackson Purchase (acquired in 1818 from the Chickasaw) in the far west of the present state; the bigger, eastern portion of Kentucky; the northern quarter of Alabama; the northern third of Georgia; the northwestern half of South Carolina; the western tips of North Carolina and Virginia; and a southwestern chunk of West Virginia. • Cherokee boundary at close of Revolution (red line): almost all of Kentucky is lost; the northern Cherokee border passes through the Cumberland Gap at the present-day state boundary tri-point between Virginia, Kentucky and Tennessee; all Cherokee lands in West Virginia and Virginia are lost; a small tip of North Carolina remains; the Cherokee are almost completely withdrawn from South Carolina; in Georgia, the loss is minimal; in Alabama the southern border remains the same. • Cherokee boundary at final cession (green line): the southern border remains the same, but in all other directions, the Cherokee Country has shrunk, now only occupying small parts of Alabama, Georgia and Tennessee. The Cherokee, with 250.000 members of federally recognised Nations and Bands (2000 census), are the most numerous of all remaining American Indian tribes in the USA. At the time of European contact in the 16th century, they lived mainly in what is now the Southeastern US. Later, most were forcibly removed west to Indian Territory (present-day Oklahoma), via what became known as the ‘Trail of Tears’. ‘Official’ Cherokee nowadays can be found in Oklahoma, North Carolina, Georgia, Kentucky, Missouri and Alabama. In California, apparently without official recognition, there live up to half a million Cherokee, the largest American Indian group in any state. In the early 18th century, a united Cherokee empire under Moytoy I and II frequently was at odds with European settlers in the Carolinas. The latter emperor, however, recognised the suzerainity of King George II of England around 1730. This did not stop European encroachment on traditional Cherokee lands, leading some Cherokee to head out west, establishing settlements across the Mississippi by 1800. Eventually, the large numbers of Cherokee in the west led to the establishment of a Cherokee Reservation in Arkansas. By 1820, this land also was coveted by white settlers, forcing the Cherokee to resettle in what is now Oklahoma. The descendants of those who stayed behind in Arkansas are still trying to get federal recognition as an ‘official’ Cherokee tribe. In the 1830s, a gold rush in Georgia sounded the death-knell for the shrinking Cherokee areas in what is now the south-eastern US. They were forcibly removed west, despite a Supreme Court ruling in their favour. These forced marches became known as the ‘Trail of Tears’. Many perished on the road, and not being able to give these dead their traditional burial, the singing of ‘Amazing Grace’ had to suffice. This song has been considered the Cherokee National Anthem ever since. In 1839 in Oklahoma, a 15 year civil war erupted among the Cherokee, leading some to relocate to Tennessee, others to seek out new lands for settlement even further west, in California (via what later became known as the ‘Cherokee Trail’). Some Cherokee managed to escape deportation via the Trail of Tears, notably over 600 Cherokee who managed to obtain North Carolinian citizenship and thus were exempt from deportation, and over 400 Cherokee who hid in the remote Snowbird Mountains. Both groups later formed the beginning of the Eastern Band of Cherokees. Meanwhile in Oklahoma, Cherokee sovereignty was constantly eroded to pave the way for Oklahoma Statehood in 1907. Only in 1938 did the Cherokee again manage to elect a principal chief for themselves. The ‘Old Settlers’ (Cherokee that moved west before the ‘Trail of Tears’) are united in the United Keetowah Band, federally recognised as of 1934. UKB members must have at least a quarter of Cherokee blood, and must descend from an ancestor on the Final Dawes Roll of the Cherokee, published in the early 1900s. The Cherokee Nation presently is a prosperous community, active in many economic and cultural fields (sponsoring the famous Sundance Film Festival in Utah, for example). A judicial ruling in early 2006 now also makes the so-called Cherokee Freedmen eligible for Cherokee Citizenship. These freedmen are descendents of African American citizens of the old Cherokee Nation.